Cardamom is part of the ginger family, native to Ceylon and India. It is a leafy-stemmed shrub reaching up to eighteen feet in height. Its flowers are pale yellow with mauve tips. The fruits contain many seeds and are gathered before they are ripe. The fruits are dried slowly to prevent them from bursting open and losing their seeds. The seeds are used whole or ground. An essential oil is distilled from them, which can be colourless or yellow. The scent of the oil is sweet, spicy and almost balsamic. It is the world's third most expensive spice after saffron and vanilla. Cardamom was first mentioned as a medicinal plant in China around AD720. It has been widely used in Chinese and Indian medicine for thousands of years. The aphrodisiac properties of cardamom are mentioned in the Arabian Nights and it is said to have grown in the Hanging Gardens of Babylon. The ancient Egyptians chewed it to whiten their teeth, and in ancient Greek culture it was used as an offering to the Gods. The Vikings brought this exotic spice back to their homeland after visits to the spice centres of the East. Today, Arab countries are the largest consumers as they use Cardamom in their ‘gahwa’ coffee. Cardamom is warming, aromatic, tonic and stimulant. In aromatherapy, it can be used to relax tired muscles and its reviving aroma refreshes the spirits. It can be warming and relaxing on tired joints. Cardamom is antiseptic and astringent and can therefore have a tightening and toning effect on the skin. It is believed, in the East, that cardamom can stimulate the mind and bring clarity and joy to the senses. The strong, intensely warm, fresh aroma is like a breath of fresh air, opening up the eyes and clearing the mind. It is said to be a spicy and sensual aphrodisiac. 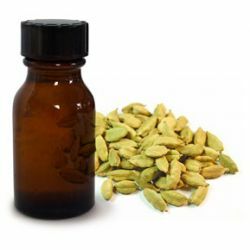 Cardamom essential oil is effective in products for stimulating, aromatic massage and to flavour lip balm. It is lovely combined with other spicy or aromatic essential oils, such as ginger. We use cardamom oil in our The Soft Touch body butter for its warming and toning effect on the skin.